The Kingsmen Bombers are Gary Spies ’67, Karsten Spies and 1970 grads Tim Pinkney, Karen Bornemann Spies, Al Spies and Lane Ongstad. During World War II, the B-24 was designed to carry fuel and bombs more than people. The crew of eight to 10 people simply worked inside them. In late spring, while riding a few thousand feet above northern California in the world’s only operational B-24 bomber, Al Spies ’70 took in a scene like something from 1944. Wires hung down around him. There was no bathroom and everything was metal, without padding. When he recalls this for an interview many weeks later, he still has a scar from hitting his head on something. The Bomber Camp, as it’s called, lasted 3 1/2 days, including abbreviated training in everything from flight navigation to radio communications, how to ditch an aircraft in water, gunnery and bomb site operation. Volunteers organized this year’s eighth annual camp for the Stockton Field Aviation Museum, working in conjunction with the Arizona Ground Crew Living History Unit and the Collings Foundation. Spies attended the camp along with his wife, Karen Bornemann Spies ’70, and their son, Cmdr. Karsten Spies, a U.S. Naval Academy graduate (’98) now serving in Denmark. Al’s brother Gary ’67 came from Seattle for the camp. The two were on a mission to remember their father, an engineer who helped to design aircraft stateside for Hughes and Northrop. 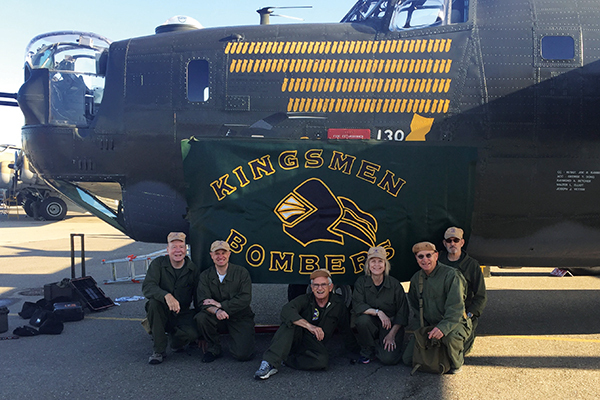 Dubbed the “Kingsmen Bombers,” the group also included two alumni with military flight experience, Tim Pinkney ’70, a retired commander in the Navy, and Lane Ongstad ’70, a retired Air Force colonel. Living at Bomber Camp for a few 14-hour days offered the Kingsmen group “some sliver of awareness” of the demands on young WWII pilots and crew members, whose average life expectancies were too short and enlistments too long. Second Lt. “Pinks” Pinkney, Tim’s father, co-piloted missions to push the Germans up the Italian peninsula in 1944. As the American occupation of Japan began, 1st Lt. William E. Bornemann flew a B-24 in sight of the grim remains of Nagasaki and Hiroshima, and once hauled office furniture from Long Beach for Gen. MacArthur. “After the war, he married, moved to Southern California and supported the idea of building a Lutheran college in California,” explains Karen, the eldest of Bornemann’s children at Cal Lutheran, before Jim ’74 and Barbara ’76. At the Bomber Camp, the group grew fascinated with the work of volunteer reenactors who remained in character throughout as WWII airmen, smoking all day and meaning Roosevelt when they said “the president.” Al has now joined the board of their organization, the Arizona Ground Crew. The group of Cal Lutheran friends also got up close with the four-engine B-17, a two-engine B-25, “and a whole bunch of little guys” such as P-51 Mustang fighter-bombers. The camp culminated in a mission in the B-24 to destroy an imaginary German factory. The group dropped four 250-pound, bomb-shaped hunks of painted concrete on a field near Stockton. Later, Tim actually flew the WWII B-25 on a sightseeing tour over the Golden Gate Bridge at 1,200 feet.